Dive Ninja Expeditions becomes first 100% AWARE dive centre in Cabo! Dive Ninjas is announcing a new collaboration with Project AWARE! We are now the only 100% AWARE dive centre in Cabo – yet another Ninja first! That’s right ninjas!! We’re really excited and proud to announce that Dive Ninjas have just partnered with Project AWARE, becoming the first 100% AWARE Partner in Los Cabos! We’ll be 1 of only 3 Project AWARE partners in Baja, and 1 of only 11 in all of Mexico – we just love breaking new ground and pushing ourselves to be leaders in our industry, with responsible ecotourism at the heart of all we do! As a 100% AWARE Dive Centre, Dive Ninjas will make regular donations to protect the underwater world we all love so much. All student divers who complete a course with us will now receive a Project AWARE limited edition certification card – helping us spread the AWARE message! Dive Ninjas already teach all available Project AWARE courses (find out more about our courses here!) aaand…. we will shortly be announcing special mini expeditions that tie in and build onto these courses – allowing students to immediately practise and put into action what they’ve just learnt! We’re really excited about this – so stay tuned for more information. Conservation and protecting our local environment, particularly the marine environment, is very important to us at Dive Ninjas, and we are proud to support Project AWARE. Many of their campaigns, such as #MakeTime4Makos, #NoExcuseForSingleUse and #DiveAgainstDebris, are close to our heart, and completely aligns with the philosophy of Dive Ninjas. As a 100% AWARE partner, our donations will help financially support these amazing programs to achieve maximum conservation outcomes. 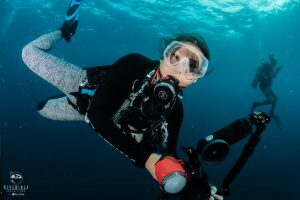 While our new Dive Ninja Ocean Warriors platform will allow us to take steps to implement and support these campaigns locally, as well as addressing challenges unique to Baja. We are 100% committed to this, and invite you all to join us in our journey to raise awareness and make things better! And, for an extra dose of ninja awesomeness, and to celebrate our new collaboration with Project AWARE, we gave away free Project AWARE courses during the raffle at the Girls that Scuba Day in Cabo on 2 March, earlier this month! Missed out? Stay tuned for more Ninja events coming soon! “Dive Ninja Expeditions has shown dedication to ocean conservation through their participation in Project AWARE activities. Their commitment to the 100% AWARE program makes them shine as they not only lead by example but demonstrate to their students the importance of supporting ocean protection. Thank you for leading the way,” says Tiffany Leite, Director Project AWARE Foundation. Project AWARE is a global movement of scuba divers Protecting Our Ocean Planet – One Dive at a Time. Focused on the critical issues of Sharks in Peril and Marine Debris, Project AWARE empowers thousands of divers in more than 180 countries to work together for a clean, healthy and abundant ocean planet. Project AWARE Foundation is a registered non-profit organization. Join the growing movement of divers striving toward a clean, healthy and abundant ocean planet. Lover of all marine animals big and small – and ok, yes, I like diving a lot! When not underwater, I can be found in London with my goldfish.